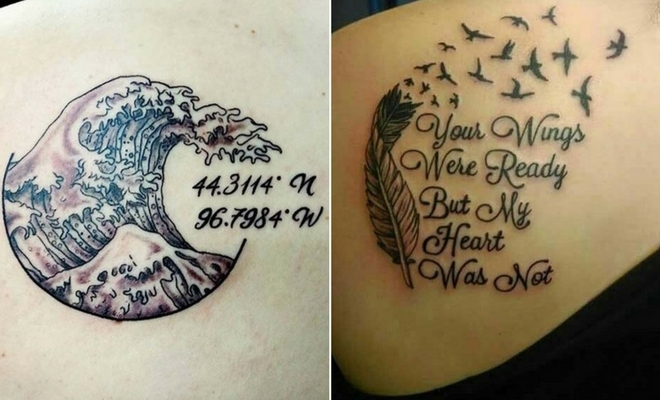 Memorial tattoos are a unique and personal way to pay tribute to someone special who is no longer here. For many, tattoos are way to show off their style, but tattoos can also express feelings. 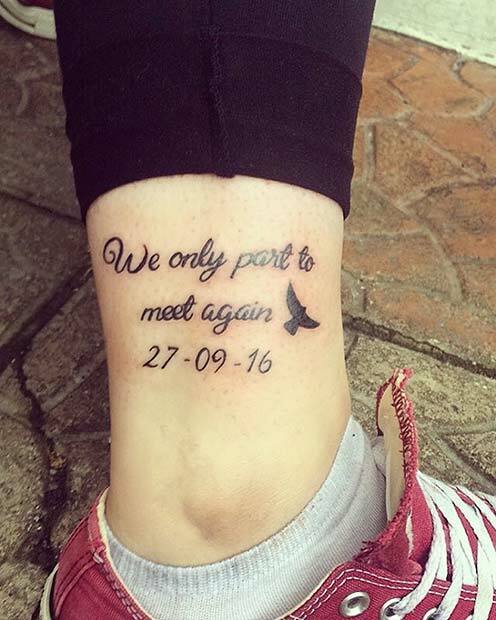 A tattoo can help keep memories alive long after someone has gone. Tattoos can honor the person and help you remember the good times. 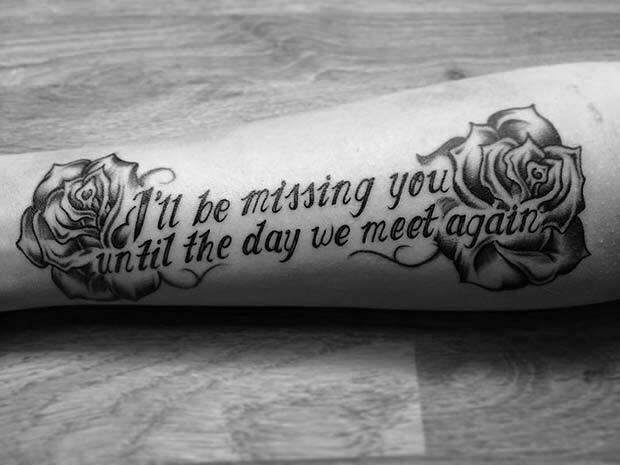 We have found 23 emotional memorial tattoos that will be a beautiful tribute to any loved one. Our first tattoo is a beautiful piece that features a bird and a quote. 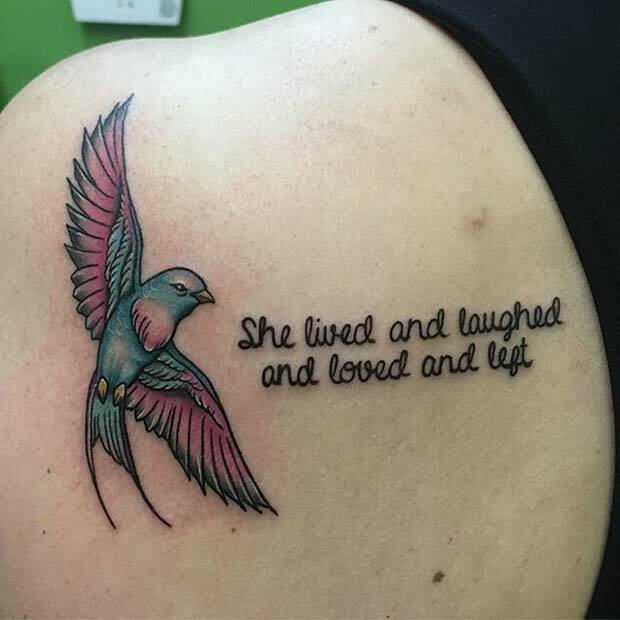 The quote reads “She lived and laughed and loved and left”. This is a tribute that says their loved one had a zest for life. It is a design that remembers the good times but also acknowledges the loss. When we lose someone, we try to hold on to them and remember them. 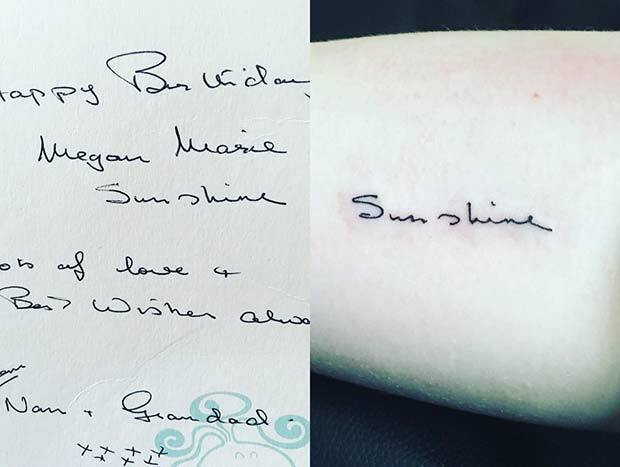 A handwriting tattoo can be a lovely way to do this. It allows you to have a piece of your loved one with you forever. This tattoo design features a word out of a hand-written letter. It is a beautiful memorial tattoo design. The next tattoo on the list features coordinates of a father and daughter’s favourite place. A design like this is a beautiful way to remember someone special. 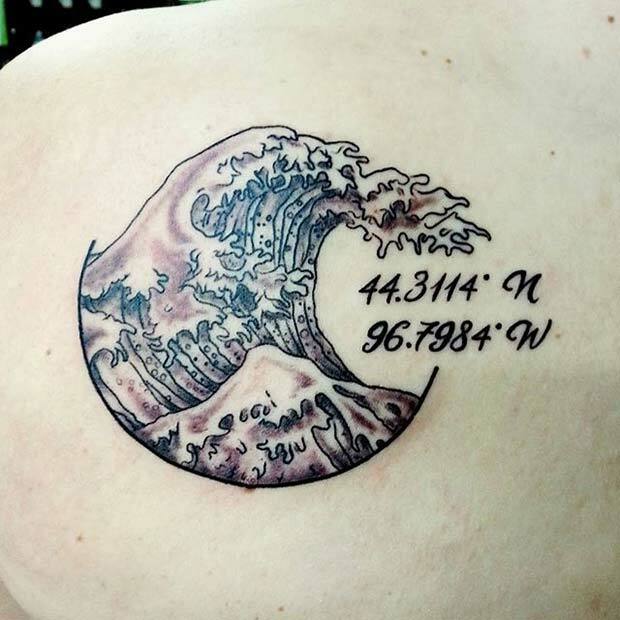 If you were thinking about a tattoo like this, you could get the coordinates placed anywhere on your body with any picture. A quote is a lovely memorial idea. 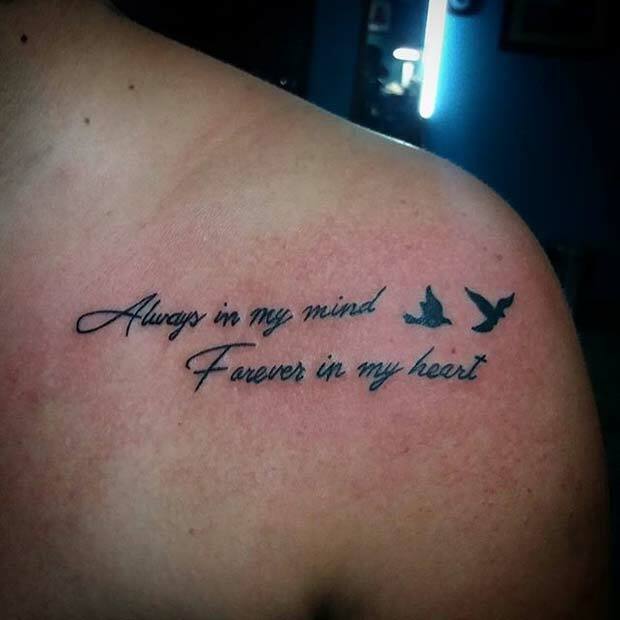 This tattoo features “Always in my mind, forever in my heart”. The quote is a way to express that you will always remember the joy and love that someone brought to your life. It is a stunning tribute. The birds are a beautiful touch. When choosing a design, consider creating something that is personal to your loved one. This tattoo has a fishing theme to remember their dad. Ink like this will evoke memories of the times you had together. The quote is both emotional and beautiful. There are no words powerful enough for the loss of a child. If you have lost a child and you want to remember them and mark their passing, consider a tattoo like this. It is a stunning design that shows the love between the parent and child. The idea of meeting loved ones again provides great comfort in times of loss and grief. That is why a tattoo like this is a perfect choice for a memorial tattoo. It is a comforting phrase that will help you through a hard time. You could have a design like this placed anywhere on the body. 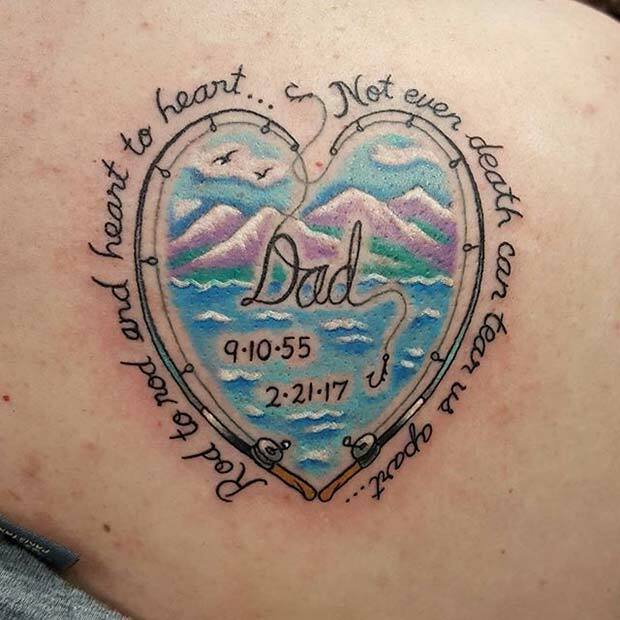 Here is a stunning memorial tattoo for someone’s grandpa. 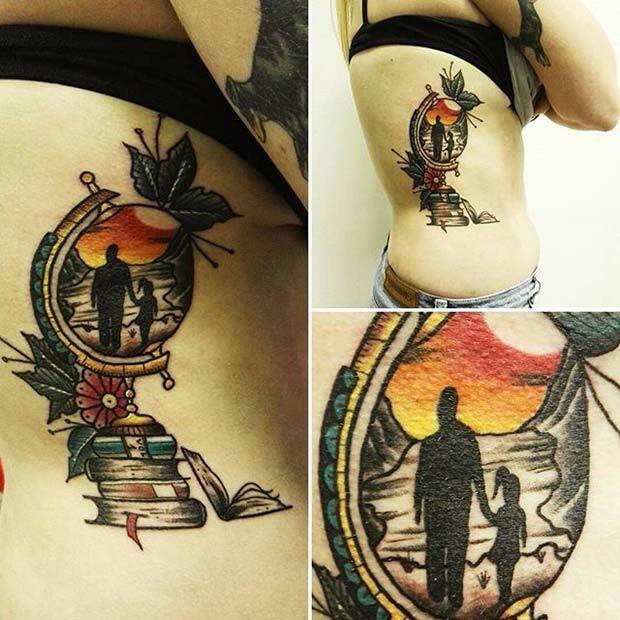 The design features a grandpa and granddaughter in the sunset. 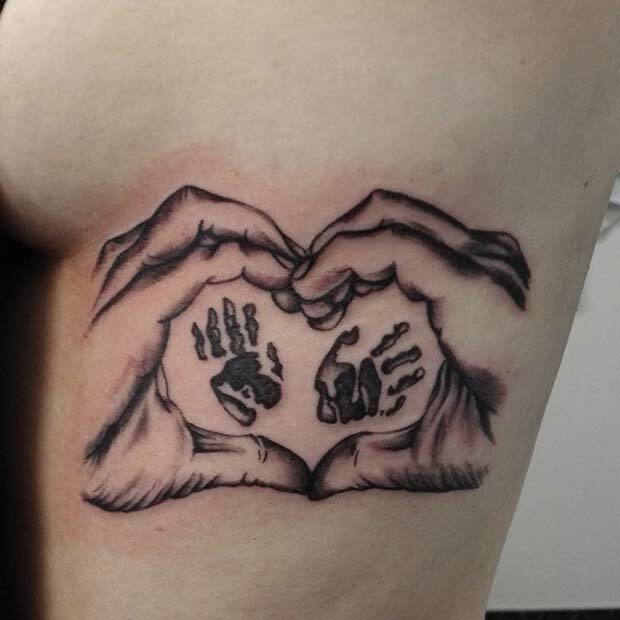 This tattoo is heart-warming and emotional, it shows the love between the two. Something like is a unique design that will keep a loved one’s memory alive. Next, we have a beautiful arm tattoo with roses and a phrase. The phrase reads “I’ll be missing you, until the day we meet again.” This is another design that will provide comfort during the hard days of grief. You could have a design like this on other places on the body too. Make it personal by having your own fonts and roses. Here is a tattoo that features a beautiful phrase. 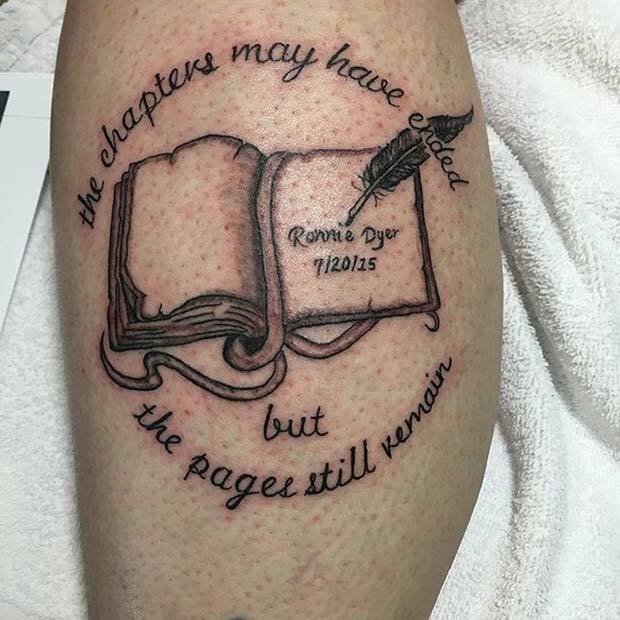 It reads “The chapters may have ended, but the pages still remain.” Something like this makes a great memory tattoo. It would also be good if you or your loved one enjoyed books. You could even just have the quote. My mom has just passed and I want to get a memorial tattoo. I don’t know what I want though. All I know is she was the world to me and her death is hitting me really hard. Getting tattoos makes me feel better so I’m gonna get one for her but I don’t know what yet. I lost my mom 20 years ago and I still miss her like crazy. I lost my best friend to suicide 4 weeks ago am going to get my first tattoo for him. He loved karate and I think I and going to get his name written in Japanese. God bless u during this hard time. U will see ur mom again. I lost my mum in 2015 and then my pops in 2016. I have memorial tattoos for both of them. My only advice would be to wait at least 6 months before you do. Fresh grief does terrible things to your impulses. Take your time and really think your decision through. So it’s about memory and not loss. Thank you for that advice, I really needed it. My mom passed away August 29, 2018. I miss her so much!! I would like something special!! Any suggestions?? Hi Kay, if you have anything handwritten from your friend, the tattoo artist can write something in your friends handwriting! My 12 year old son Passed away on Nov 16th 2018. I am going to get my first tattoo in memory of him I have some ideas but not sure what to do. I lost my mom in 2002. I decided I wanted to get my first tattoo to memorialize her. It took me 10 years to decide what design I wanted. I decided to incorporate her three favorite things – roses, pearls and hummingbirds. I suggest to all of you who are considered a memorial tattoo – take your time, decide what means the most to you-what makes you think of them when you see or hear it? Then look at different tattoo artists and find one whose style you like. Last, but not least, decide on the size and placement of the tattoo. If I had to do it over again I wouldn’t have my tattoo on my shoulder where I can’t see it except in the mirror. My husband lost his twin sister unexpectedly 2 years ago in November. When we would get together, she played old maid with our kids. She would always put OM card higher in her hand and my son would take it every time. We would laugh and he would get so mad. My son got a tatt of four cards fanned from the OM deck, with the OM higher. I sgree, take your time and think of a great memory to tattoo! I lost my son on 4/14/2018. I want to get a tattoo in his memory. I know what I would like but I don’t know anyone who can draw it for me. I want 2 blue clouds with his face coming through the clouds. This will be my first and last tattoo. I lost my mom on my birthday of all days 2 1/2 years ago. Most devastating day of my life that I used to considering being a happy day celebrating my life. To lose my mom on the exact same day she brought me into this world exact 32 years later. I felt like I was being shredded apart from the inside out. Tattoos have always helped me through all my hard emotional times. I didn’t wait to think about a tattoo idea. I just went. My dad gave me a original signature document of my moms signature 2 days later it was on my arm and it is one of my favorite pieces. in 2010 I lost my grandmother to cancer. it hurt but I was young and didnt really understand. this last year within 6 months I lost 3 grandparents all unexpectedly. Losing all of them so suddenly really hit me hard, and knowing that I wont have them by my side for the rest of my life. I am still young so it seems impulsive but I want to get a tattoo to commemorate all of them because they played such a big role in my life. I’ve been thinking that I want all of their signatures with the dates under them but I dont have my heart set on this one specific design. any suggestions? I lost my son in 2015 at the age of 10 to leukemia. On my inner forearm I have a tattoo that reads: For the love, For the life, For the fight. To me, this is not only for him, but also all my family and friends I have lost to illness.